Laurel Lawson and Alice Sheppard (above right) demonstrated the connection between physics and engineering and dance. Alice Sheppard uses a wheelchair, but not just to get from one place to another. She’s built a life around transforming it into a vehicle for self-expression. 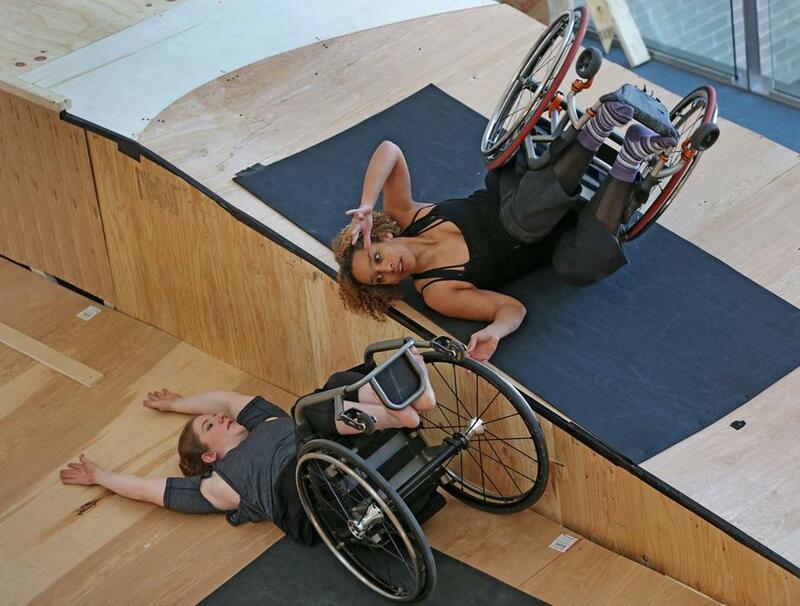 A celebrated disabilities dancer and choreographer, Sheppard incorporates her wheelchair into her performances, using it as an extension of her own body. 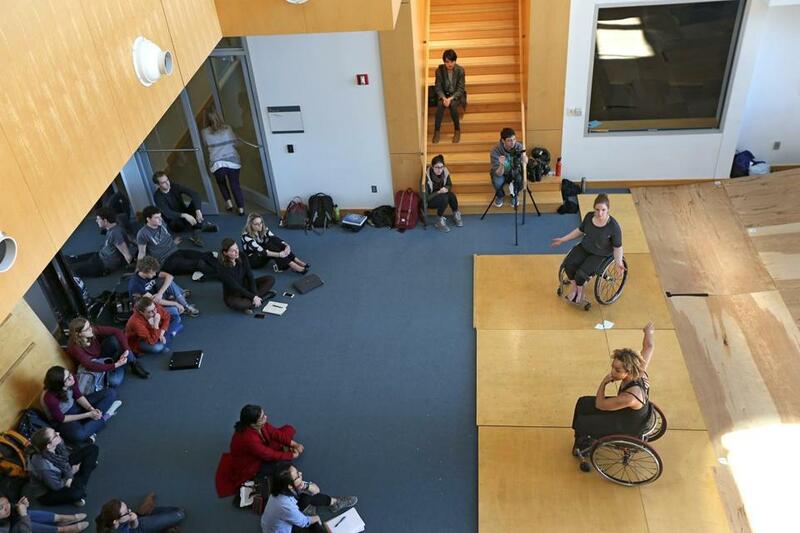 Her knack for expressive movement on two wheels was on display on a recent Wednesday morning at Olin College of Engineering in Needham, where she tried out a prototype ramp designed and built by a group of students. The ramp, consisting of an upper level that drops down into a corner bowl before extending into a wide, gradual decline, is the first of its kind in the disabled dance world, Sheppard said. Testing it out in front of the students, she found herself in an unusual position: on her back, wheels pointed straight up as she twisted and rolled her upper body along the inclined wooden platform. Her wheelchair sometimes clanked against the wood, but her torso remained strong and controlled as her gaze and arms extended out to the crowd amid her movement. With Sheppard was her dance partner, Laurel Lawson, who at one point lifted Sheppard herself on the raised platform. The idea for the ramp came from Sheppard, but the planning, modeling, and manufacturing all took place on the Needham campus, spearheaded by a group of Olin undergrads. “This weekend was exhausting,” said Duncan Hall, a freshman computer science student, who spent hours with a dozen other students affixing sheets of plywood onto a wooden skeleton to create the gently curved ramp. Their efforts came to life when Sheppard and Lawson gave their demonstration and chatted with the students about the connection between physics and engineering and dance. “It’s cool to see the movements that we have facilitated by constructing this,” Hall said. The partnership between Sheppard and Olin began a few months ago when the dancer contacted Sara Hendren, a professor who specializes in adaptive technology often focused on aiding people with disabilities. Hendren teaches a class called Investigating Normal that questions the preconceived notions of assistive technology. Then fellow Olin professor Yevgeniya Zastavker serendipitously reached out to Hendren in search of a long-form project involving ramps for her first-year mechanics class. Now with the necessary helping hands, Hendren, Sheppard, and the students began collaborating to take Sheppard’s vision and apply it scientifically. The students began workshopping, splitting up into groups and modelling sections of the ramp with paper, 3-D printers, and computer-aided design programs. “The students took it on and it just mushroomed,” Hendren said. After weeks of tinkering with models and Skyping back-and-forth with Sheppard, who spends most of her time in San Francisco and New York, the group landed on a final design that was brought forward by sophomore Scott Mackinlay. Following the grueling build weekend, the students finally got the chance to relax and appreciate their hard work with a laid-back session with Sheppard and Lawson. The dancers commended the students’ work and above all stressed the importance of their partnership’s ability to meld science with art. Sheppard plans to take the prototype plan to set designers who can build a finished product that she can travel with for her performances. Olin College students listened as Alice Sheppard and Laurel Lawson talked about the project. Bailey Putnam can be reached at bailey.putnam@globe.com.